Super Jack by Susanne Gervay. Review: No, I want this! Starts the bickering in Super Jack. Have you ever had to increase your family? If you have, then you will be to relate to the book Super Jack a heartwarming and caring story written the author Susanne Gerway. Super Jack is about a 12-year-old boy named Jack who needs to get used to taking in new family members of his family. After living with his sister, grandma and mom, his mom dates a man named Rob. Then when Rob declares that he wants to take a family trip up North to see his son Leo, it sounds like the perfect family vacation because of the gorgeous beaches, the awesome theme parks and the fact that Jack can bring his friend, Anna along; but will Leo's presence will it ruin the whole thing. When on this vacation they could do a lot of fun things like eating ice cream and a lot of fun family stuff. But when Jack finds secretive stuff about Leo like how he does not like Nana or how he hid the big bag of gummy worms he may not be able to cooperate with him. However, in the end, Jack and Leo need to unite in order care for someone who is the loveliest person in the world. Super Jack was very realistic, for example, in the story the whole family bickers which is common behavior in many families. Also Jack's family goes to vacations, to theme parks, they eat breakfast together, and so much more! I also like how Jack has a conflict with Leo because I sometimes fight with my own brother. Another good thing about this book was that Gerway used the most age appropriate words for this book. Another way Gerway did what all good authors do, is that she made the setting one of the big elements of the book; because without the traveling or Jack's house all of this couldn't happen. One thing I didn't like was the jokes because sometimes they were a little crummy, but that is okay because in general, Gerway did write a good story. She even wrote another book, I Am Jack which involves the same characters. If you want to find a book where you can relate to the characters and plot. This book is also good for a family to read together because they can relate to this book, even with young readers. We would like to thank Kane Miller for providing a copy of Super Jack for this review. 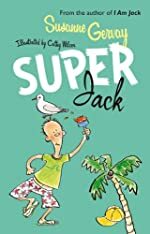 Have you read Super Jack? How would you rate it?